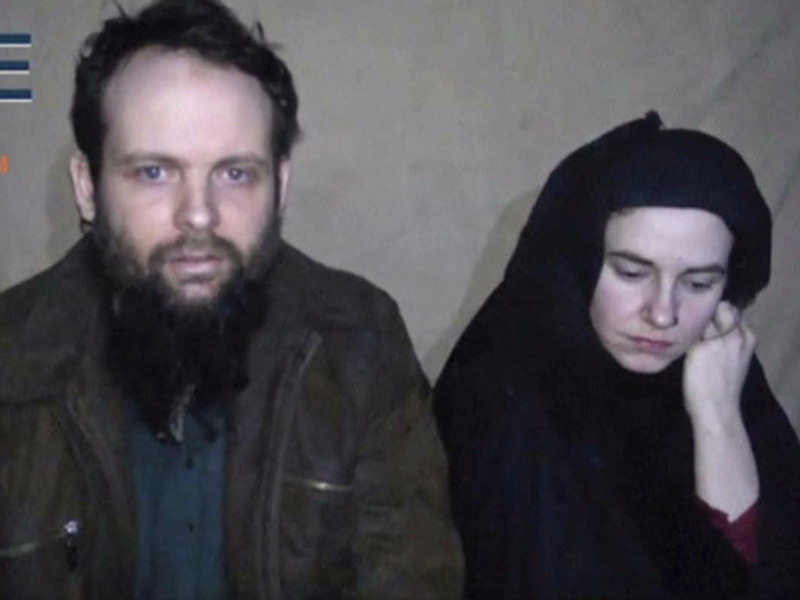 Canadian Joshua Boyle and American Caitlan Coleman, who were kidnapped in Afghanistan in 2012, are shown in an image from 2016. Disputing claims about her rescue, the recently recovered Caitlyn Coleman has said that she was in Pakistan for at least a year before she was "rescued" by Pakistan Army in an operation near the Pak-Afghan border earlier this month. While speaking to the Toronto Star in her first interview since her recovery, Coleman said: "Right now, everybody’s shunting blame and making claims. Pakistan says no, they were never in Pakistan until the end. The US says, no they were always in Pakistan; it was Pakistan’s responsibility. But neither of those are true." She also said that she is certain that they were held in both Afghanistan and Pakistan. "We were not crossing into Pakistan that day. We had been in Pakistan for more than a year at that point." Coleman, an American national, revealed in the interview — published on Monday — that the couple were moved to Pakistan immediately after being kidnapped in Afghanistan. "They first took us out of Afghanistan; it was several days’ drive," said Coleman, who still wears a hijab after being released. She refused to comment on whether the couple have converted to Islam. She said that her kidnappers took them to Miramshah in North Waziristan where they were kept for almost a year, adding that they knew where they were because her husband, Joshua Boyle, could understand some Farsi. "It was very bad. My husband and I were separated at that time. He wasn’t allowed to see Najaeshi or spend any time with us." Najaeshi Jonah is their oldest son. "Then we were moved to the north of Miramshah, to the house of a man who said he was called Mahmoud. He was very nice to Najaeshi and would provide us with amenities [that] we wouldn’t have otherwise," she told the Toronto Star. "He would take Najaeshi out to get him sunlight and nobody else did that at any other point." She does not exactly remember the events around her rescue but does recall a gun battle while she was in the trunk of a car. "Our first fear — why we were not poking our heads up and yelling for help — was that it was another gang trying to kidnap us. Possibly just part of the Haqqani network fighting with another part. They’re all just bandits," she said about her rescue. "You’re a prisoner for so long, you’re so suspicious. I was still thinking we don’t know these people, we don’t know where they’re taking us." Of her reaction on realising it was the Pakistani forces and not another group of captors, she said: "I think I was mostly just in shock." While revealing details of the rescue, Pakistan Army had said that the family had been moved from Afghanistan into Pakistan the day the operation took place, not earlier. Backing her husband's earlier claims of Coleman being raped in captivity and the forced abortion of their child, she said that the assault on her happened because they wanted the couple to stop contacting people who were not their guards or captors. The Taliban had refuted the claims, saying that the child had died naturally and that the woman had not been raped in captivity. They named their unborn child "Martyr", she said, who was killed because the captors were angry at Boyle for not joining them. They killed the child using using high amounts of estrogen in their food and boasted of what they had done, she told the daily. Her next two pregnancies were kept secret and the babies were delivered by Boyle using a flashlight. "We had a pen they didn’t know about and we were taking little scraps of paper and trying to hand out notes to anyone and everyone that wasn’t one of the guards or commanders involved in killing Martyr," she said regarding the alleged assault against her. "But then they took us, separated us, and beat us and that was when the assault on me happened because they wanted us to stop." The couple and their children were frequently moved between Pakistan and Afghanistan, according to Coleman. From their house north of Miramshah, they were then taken to Spin Ghar in Afghanistan. Coleman also shared lighter moments they had in captivity, including naming the places they were kept in. They called one "Cat Hotel" because it looked like a hotel to them. She claimed they could see the Pak-Afghan border from there. The kidnappers acquired a Pakistani-styled "jingle truck" from there, told Coleman, and moved them to an area between Kohat and Bannu. Their last "home" was named "Dar Al Musa", she said. "Outside everyday they were doing some training or something was going on, and some guy was shouting and we laughed because whoever Musa was, he was not doing a good job," she said. "He was always yelling, 'No, no, no, Musa Musa.'" They were there since November 2016, she said, and were then transferred to the "Mud House" just two days before their recovery. Coleman said she was kept in a car's trunk and was being moved when the gun battle that led to their rescue took place. They were usually drugged and kept in the trunk whenever they were moved, she said. Speaking on the couple's decision to have children in captivity, she said that, among other things, she wanted a large family and they did not know when they would be released. "It was a decision we made. We did think about it [...] it’s difficult to explain all the reasons, but, for me, a large part was the fact that it has always been important to me to have a large family," she said. "This took our life away from us — this captivity with no end in sight. And so I felt that it was our best choice at that time. We didn’t know if we would have that opportunity when we came back. We didn’t know how long it would be. It was already unprecedented, so we couldn’t say, 'Oh we’ll only be here a year or six months.'" Disputing claims about her rescue, the recently recovered Caitlyn Coleman has said that she was in Pakistan for at least a year before she was "rescued" by Pakistan Army in an operation near the Pak-Afghan border earlier this month. While speaking to the Toronto Star in her first interview since her recovery, Coleman said: "Right now, everybody’s shunting blame and making claims. Pakistan says no, they were never in Pakistan until the end. The US says, no they were always in Pakistan; it was Pakistan’s responsibility. But neither of those are true."